Exactly 50 years ago, two visionary leaders met in an unfurnished tent in a stretch of desert on the Abu Dhabi-Dubai border. 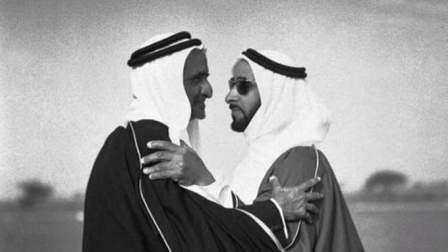 At the end of the meeting on February 18, 1968, the two leaders had taken the first step towards establishing the UAE. It was on this day that the late Sheikh Zayed bin Sultan Al Nahyan, the then Ruler of Abu Dhabi, and Sheikh Rashid bin Saeed Al Maktoum, the then Ruler of Dubai, agreed to form a country. A young boy witnessed the historic moment. And 50 years later, he took to Twitter to reminisce about the meeting. His Highness Sheikh Mohammed bin Rashid Al Maktoum, Vice-President and Prime Minister of the UAE and Ruler of Dubai, tweeted on Sunday: "I was there and I saw a meeting of good intentions with high ambitions in a tent without furniture. I heard Rashid saying to Zayed, 'You are the leader'. Therefore, Zayed was the president, father and founder, and the eternal leader of the state. Zayed did not ask for the presidency, but history called on him to build a nation and a state." Sheikh Mohammed reminded residents that the country started its journey in the desert and has now reached into space. "Today, the nation looks back at this memory so we do not forget our beginning and our good intentions ... We will continue working towards our people's happiness and prosperity. "February 18 is a historic day for my beautiful country." In 1968, the British government announced its intention to terminate its treaties protecting the Trucial States and withdraw its forces from the Gulf by the end of 1971 under pressure from adverse economic conditions. The sudden decision helped reduce the obstacles that had hindered the earlier attempts to unify the emirates. Because of these new forces that had been mobilized, Sheikh Zayed, then-ruler of Abu Dhabi, had initiated the first move towards establishing a federation along with Sheikh Rashid. The federation was intended to be the nucleus of Arab unity and to protect the potentially oil-rich coast from the ambitions of more powerful neighbouring countries. According to the National Archives, the initiative taken by the two founding rulers resulted in a meeting, on February 18, 1968, at Al Sameeh on the Abu Dhabi-Dubai border. This was the historic meeting where Sheikh Zayed and Sheikh Rashid agreed to merge their emirates into a union to jointly conduct foreign affairs, defense, security and social services and to adopt a common immigration policy. To strengthen the federation further, Sheikh Zayed and Sheikh Rashid invited the rulers of the five other Trucial States, as well as Bahrain and Qatar to join in the negotiations for the formation of a union. They left other administrative matters to the jurisdiction of the local government of each emirate. For over three years, the 11-point agreement, conceived in Dubai, served as the basis for intensive efforts to set up the constitutional and legal framework for this 'Union of Arab Emirates', comprising of the nine member states. After several formal meetings and discussions, the summer of 1971 Bahrain declare its independence on August 14. Qatar followed suit. Authorities of the seven Trucial States worked out an alternative to the 'Union of Arab Emirates'. The Rulers of the six Trucial States, excluding Ras Al Khaimah, had decided to form the United Arab Emirates at a meeting held in Dubai on July 18, 1971. The foundation of an independent, sovereign state was formally proclaimed on December 2, 1971. Ras Al Khaimah later joined in February 10, 1972 where the federation was complete and United Arab Emirates was announced.